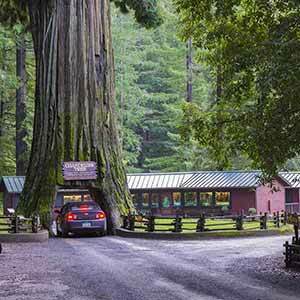 Northbound Highway 101 passes through three small redwood parks, each with more impressive trees than the last, before reaching the most impressive redwoods of all in Humboldt Redwoods. Standish-Hickey is the first of these parks and, when seen from the highway, is the least scenic of the three. 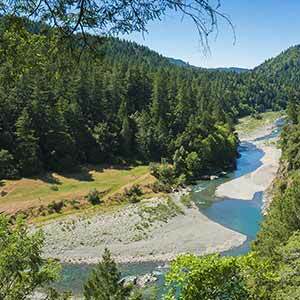 Driving through, you wouldn’t guess that there’s a redwood grove here, and in fact the park’s most popular features are not its trails but its campgrounds and its swimming area on the crystal-clear Eel River. 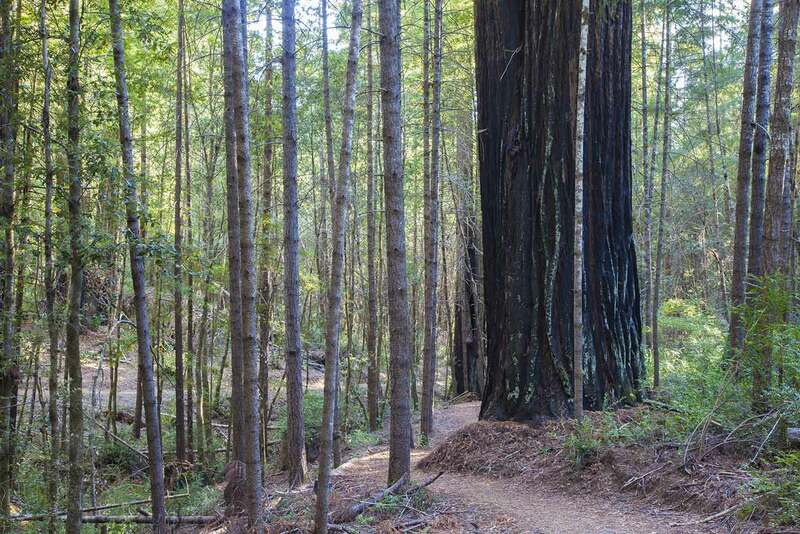 Nonetheless, a half-mile trail leads to a small upland grove with a few small redwoods. The redwoods have apparently not been logged, but it seems that the grove been logged of other trees, leaving about ten or twenty medium-sized stumps. The regenerating forest has a somewhat odd appearance, consisting of a lot of really small conifer trees growing among a few dozen widely-scattered, small-to-medium redwoods. Many of the redwoods are blackened and the grove is somewhat dry-looking, with little groundcover except for some mounds of huckleberry bushes alongside the trail. Just east of the loop is a dirt service road that’s not connected to the trail. The dirt road runs from an employee residence to a water tank. Interestingly, although it’s only about ten yards from the trail, the woodland along the dirt road has a lusher and much more normal old-growth redwood upland look than the loop trail, with the arrow-straight trees and healthy groundcover characteristic of old growth. 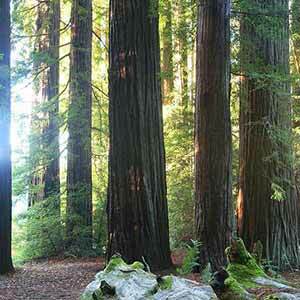 The main body of the park, across Highway 101 from the old-growth grove, has three campgrounds. 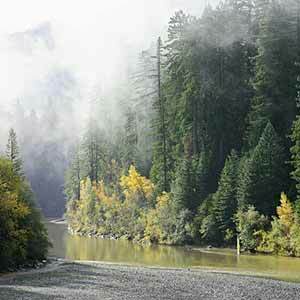 Two are right next to the highway, but the Redwood Campground, set among second-growth redwoods down by the river, is much quieter. 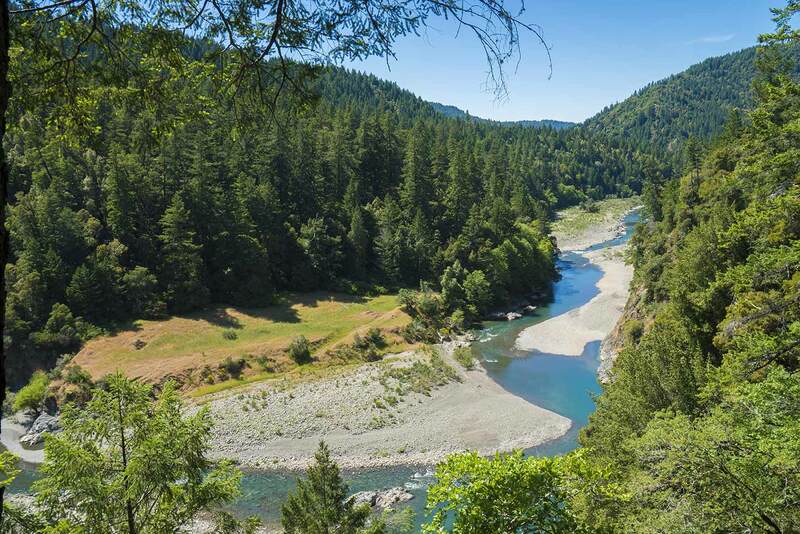 The Eel River flows in a gorge a hundred feet or so below Highway 101, and the bottom of the gorge is mostly shielded from the traffic noise. The river features a swimming hole, one of the park’s more popular features. The park also has some well-designed and well-maintained trails that wind though the (mostly) non-redwood forest on the hillside opposite the highway. These trails all get some traffic noise, but are otherwise very enjoyable to hike. 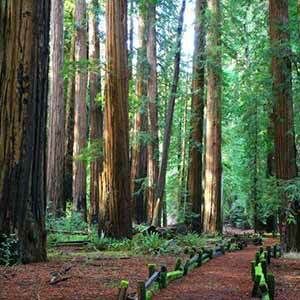 They as well as the Redwood Campground are only accessible in the summer via a seasonal footbridge. The main body of the park features the Captain Miles Standish Tree, a good-sized redwood standing in isolation in a heavily-logged grove. The hillside just east of the tree has some unlogged redwood forest, but the redwoods are too small and widely-scattered to be considered old growth. 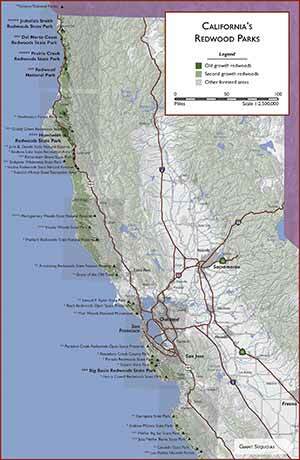 Driving north on Highway 101, just after Legett you’ll see the entrance to Standish-Hickey on your left. Ignore this entrance and continue a few yards, pass the old police car parked on your right, and then turn onto the second dirt road to your right. The road is partly hidden by some trees. 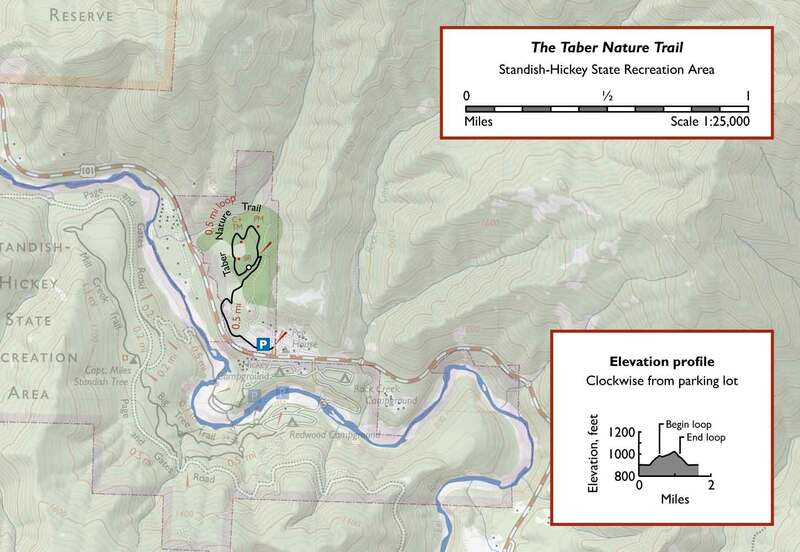 There’s a well-marked trailhead and a small dirt parking lot. 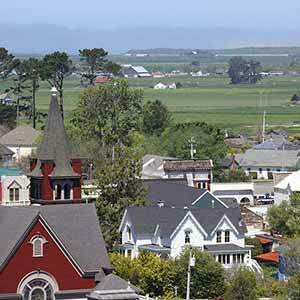 There’s quite a bit of traffic noise from Highway 101 as the trail sets out. A bit of trail near the beginning that can get overgrown, but otherwise the trail is clear and very well-maintained. The trail enters a tanoak wood, winds around a house, and begins a gentle climb. The traffic noise fades out, although it never completely disappears. 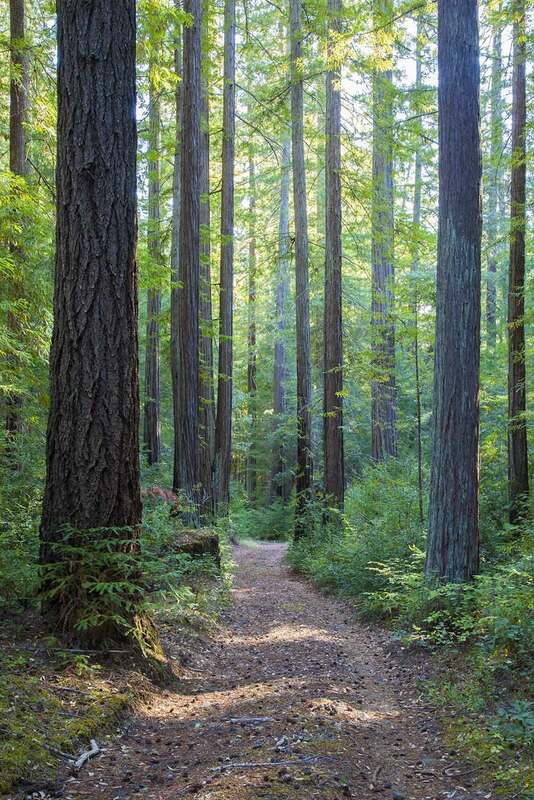 The trail follows a little ravine where a few small scattered redwoods grow, then enters the main redwood grove just before reaching an intersection with the loop portion of the trail. There’s a relatively dense cluster of redwoods around this intersection. Turn left onto the loop, which winds around a small plateau. 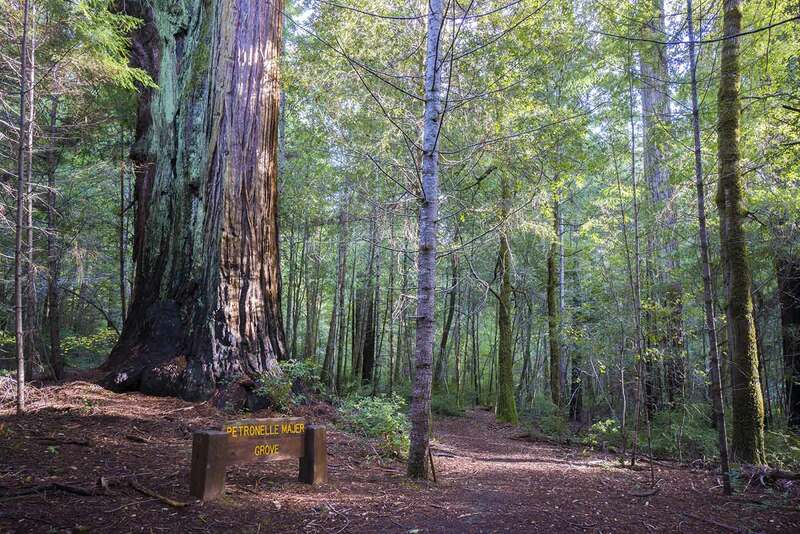 At the north end of the loop, next to the Petronelle Majer memorial sign, is an especially large redwood that actually consists of several trunks fused into one at the ground. At the end of the loop, turn left to return to the parking area.